Vaccines Are So Crucial For Child's Health as they provide protection or immunity to certain viral and bacterial infections that can cause serious illness and death. Vaccines work by revving up the body's immune system to make antibodies that recognize a particular germ and fight it off. And thank goodness, vaccines are so effective. These diseases are not ones you ever want your child to have. As a result of universal vaccination, small pox has been completely eliminated and polio is rare in most parts of the world. And vaccines have significantly reduced the incidents of the top 3 causes of bacterial meningitis. Infections like measles, diphtheria, and tetanus that used to sicken and kill children are unfamiliar to most parents today. But other than small pox, these infections still exist, an outbreak still occur particularly in under vaccinated communities. If more than 10 percent of American parents choose to opt out of vaccines, our entire country would see these horrible diseases return. Fortunately, over 99 percent of American parents do vaccinate their children proving Vaccines Are So Crucial For Child's Health. Your newborn gets his very first vaccine, hepatitis B, in the first hours or days of life. But the rest of the routine vaccination series starts at 2 months of age, with additional shots at 4 months, 6 months, 12, 15, and 18 months, and some blister shots are given between 4 and 6 years old to maintain long term protection. Yes, it is a lot of shots. Yes, there are more shots than you and I got as kids. But that is a good thing. Even though the number of shots has gone up, a child's immune system actually has less work to do to mount a protection response. That's because today's vaccines are smarter and safer for Child's Health. A vaccine like any other medication has a small chance of causing an adverse reaction. Most side effects are minor like a slight fever, fussiness, or temporary redness of the skin. The risk of having a serious event like an allergic reaction is about one in a million, and the benefits definitely outweigh the rests. Pain medications like a acetaminophen can help ease the discomfort that comes with getting shots. 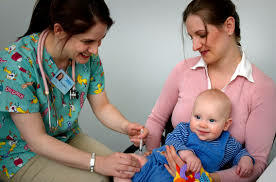 But giving a dose before or shortly after those shots may limit the body's immune response to the vaccine. That's why many pediatricians suggest waiting a few hours after those shots to give your child a dose of medicine. Don't worry, your baby will probably have an easier time getting those shots than you will watching it. But you can feel better knowing you are doing your best to protect your little one.